Appearing most often in burial scenes, the tekenu was a mysterious figure that shows up on tomb paintings and funerary texts – though who he is or why he appears remains unknown. The tekenu seems to be the figure or shape of a man, and is shrouded in either a bag, animal hides, or a sack that is placed on its own sledge in the midst of a funeral procession. One theory suggests that this shrouded figure was actually a sack of spare body parts left over from the mummification process, since it was pulled alongside the canopic jars and sarcophagus containing the mummified corpse. If this is the case, the images of the tekenu where he has a face must mean that there was a mask or a false head placed at the “neck” of the sack, causing the tekenu to appear as if it was a real person. It may have also simply served as an image of the deceased individual himself. Other suggestions have been made that try to link the tekenu to possible human sacrifice in ancient Egyptian history. One oft-cited piece of evidence for this comes from an inscription found on the Tomb of Rekhmire, which reads: “Causing to come to the god Re as a resting tekenu to calm the lake of Khepri.” The thought is that this may be a remnant from a time when humans were killed and thrown into a lake to appease certain gods – however, there is no additional evidence for this, nor for the tekenu ever having been a human sacrifice. 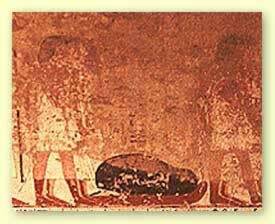 In fact, in the Tomb of Mentuherkhepshef (try saying that five times fast) from the 18th dynasty, there is a man lying on a sledge, just like the tekenu, but unshrouded. 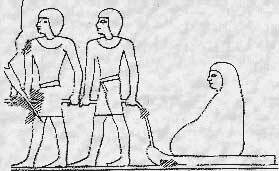 In another scene from the Tomb of Rekhmire, the tekenu is removed from his sledge and placed on a chair inside a tomb, placed with its head poking out of the bag. In the scene following this, the same man is sitting upright on the chair, wearing a shroud wrap but also clearly supposed to be alive. The priest’s visit to the spirit world was supposed to give him powers that subsequently enabled him to perform the traditional ‘Opening of the Mouth’ ceremony that was held during all burial rituals. Essentially, the role of tekenu was then to go through a state of metamorphosis from the tekenu to Sem – a transition from death to life. Of course, there are currently no other texts that might support this interpretation… but this is the most plausible theory thus far. 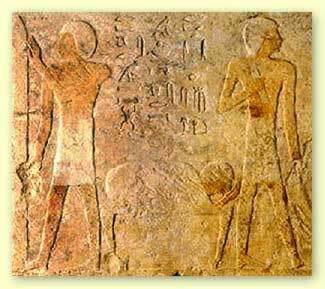 *Greg Reeder, “A Rite of Passage: The Enigmatic Tekenu in Ancient Egyptian Funerary Ritual”, KMT: A Modern Journal of Ancient Egypt 5 (1994).